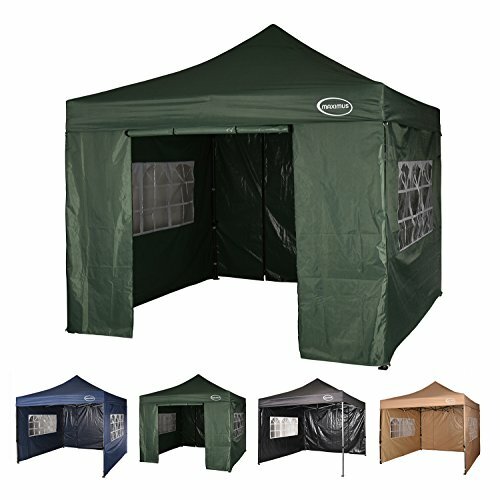 This Maximus shelter is a great pop up gazebo for the price. With its extremely strong frame, further complemented with a canopy that can keep you dry pretty much whatever the weather, it is a perfect match. The 3 frame leg height settings is a very convenient add-on and it makes it really easy to adjust the height, especially with the easy sliding locking pin. When you buy this 3x3m Maximus gazebo you will receive everything you need to hold your event without the requirement to buy anything else. In this section, we will scrutinise the claims of the manufacturer to better help you understand exactly what this pop up gazebo can and can’t do. The frame is made from what the manufacturer states as ‘industrial grade steel’ and unlike many other brands of gazebo they don’t tell you to not use it in very bad weather, that’s how confident they are about its strength. Even in the image on Amazon, you can see several people hanging from the frame which clearly shows the resilience and robustness of the frame. The frame is powder coated to form a tough protective layer between the steel and the atmosphere to protect against rusting as well as adding further strength. The frame also has 3 height adjustment settings for convenience. The manufacturer has stated that the material is 600D with an extra added waterproof layer. At first, I was unsure how the ‘denier’ converted to ‘gsm’ because the two are very different measurements but both imply strength or resistance of the material. However, the manufacturer has indicated that the 600D is equivalent to 310 gsm which if correct and there’s no reason why it shouldn’t be, is extremely waterproof. This 3x3m Maximus is more than capable of repelling any amount of water poured on to it. This score is based entirely upon my own opinion after reading in detail about everything this product has to offer. A very strong 3m pop up gazebo that can keep your event dry even in the heaviest downpours. Recommended.